I am a fairly laid back kinda guy and am quite often late for things, "No stress." I am often heard to say. 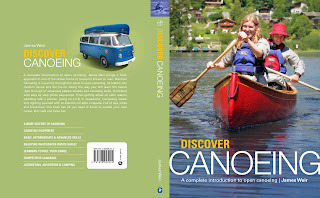 However I have recently become as impatient as a small child in the back seat of car, I want to see a copy of my book, Discover Canoeing. Plan A was that it would be out before Christmas, and that went out the window last Autumn because I went to the Grand Canyon instead of staying home and finished the final proofs. Plan B was last Sunday, the 28th February, through no fault of mine, or anybody else as far as I can work out it is now due be delivered on the 23rd of March. Good things take time and I am confident DC is a good thing BUT I just wish it would be printed! I am really looking forwards to spring and the European paddling season, I start start back with Kanuschule Versam next weekend, 6th and 7th March with an Eskimo rolling course in Chur Switzerland, there is still one place free so if you a keen to learn or improve your Eskimo roll in open canoe drop them line in the office on +4181 6451324.